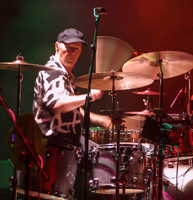 Bobby regularly tours the world with The Hollies and still lives locally. 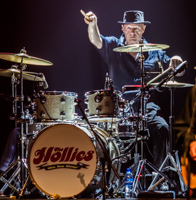 In the family living quarters of his mother’s bungalow grocery shop at Pike Hill, Burnley, The Hollies’ young powerhouse would drum on a veritable assortment of empty containers. Robert’s (Bobby’s) Meccano construction set formed the hardware and stands. “Set up in front of our Bush radiogram, I would accompany the Benny Goodman Orchestra and be Gene Krupa on a Cadbury’s Roses tin with the lid slightly askew. This produced a nice rattling Radio King snare effect. Whilst at Nelson Grammar School, Elliott paid the princely sum of £2 for his first real snare drum: “Complete with sticks and brushes”. “I’d heard of this local kid; Tony Hicks, who had a band called The Dolphins. Tony was a fine young guitarist. I liked his playing. He liked my drumming and I became a Dolphin”.